The Tablets of Thoth are imperishable, resistant to all elements, corrosion and acids. thus violating the material law of ionization, according to Bibliotecapleyades. The Tablets are fastened together with hoops of a golden colored alloy suspended from a rod of the same material. a translation of ten of these twelve Tablets. He has divided the ten into thirteen parts for the sake of convenience. 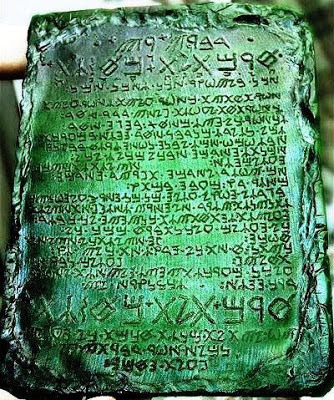 The last two Tablets are found in the “Interpretation of The Emerald Tablets”, also by Dr. Doreal. he erected The Great Pyramid over the entrance of the Great Halls of Amenti. In the Pyramid, he posited his records and appointed Guards for his secrets from among the highest of his people. y those in the age of darkness which followed his passing. where the soul passed after death for judgment. which he wrote and left in the Pyramid for those of a future Age of Light. written by Thoth, the Atlantean from the Lost city in Time of Atlantis. Second Video release of the Emerald Tablets by Lou Bernedetto. over 50 000 years ago. Thoth is a Human being that lived in a time long ago during an age now lost to us at presant. Atlantis was a great civilazation that thrived & flourished for many Tens of Thousands of Years. Not only were they rulers of the sky and the land around them. these writings quickly became an underground sensation among esotoricists of the time. these writings would be considered channeled material today. having founded the metaphysical church and college. who shape and form the spiritual evolution for mankind. in their quest for oneness with God and attainment of the cosmic consciousness. Doreal began publishing his findings in a spiritual retreat in Colorado named Shamballa. the wisdom of the Kabbalah, and the light Jesus brought to mankind. in order for all of us to reach atonement within ourselves and the cosmic universe. All his publications are available through the brotherhood of the white temple publication office. for they elaborate and deepen the meaning of the historical Emerald Tablet and writings of Thoth/Hermes.